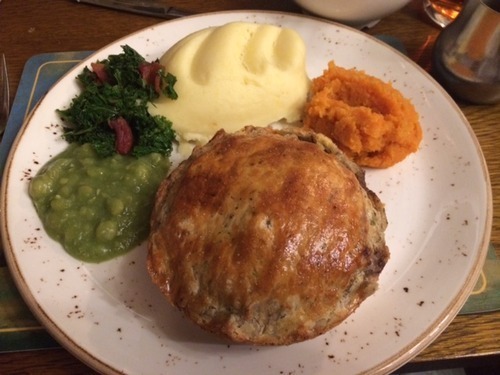 After 15 years of pie hunting, we stumbled on London’s best all round pie experience on Wednesday at the Windmill pub in Mayfair. We had a table booked in the Pie Room on the first floor. Encouraged by signs advertising its very own pie club, we were offered a menu chock full of traditional pie favourites and some additional seasonal specials. Starters of whitebait, crispy chicken and pigs in blankets were followed by a steak and kidney and four chicken, ham and leek thick crust pies with mash (£12). Sides were excellent, fresh homemade veg portions of carrot/ swede mash, kale and bacon and mushy peas. Extra gravy did have to be ordered. A Youngs pub, the special amber ale gained full approval. Service was excellent and the our waitress asked for special dispensation from the chef in order to bring us desserts after kitchen closing time. We shared very good sticky toffee pudding and apple crumbles with custard.